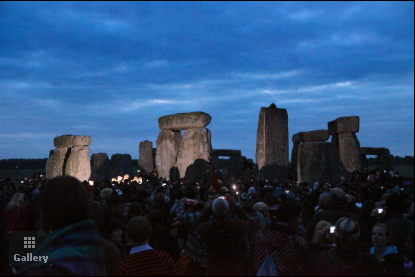 June 21, 2009 – This year Summer Solstice brought together more than 35,000 Pagans, partiers, tourists and curious event goers to one of Earth’s most prehistoric monuments for the annual Summer Solstice; a mid point of summer and the longest day of the year. The crowd of people were met by the Sun’s rays at approximately 4:58 a.m. BST. Crowds of people gathered together the previous afternoon for dance, music, alcohol and celebration. For many, the Solstice provides an opportunity to dress in traditional Druid garments and to network with like-minded history buffs and authorities of faith.